but pears?! No thank you. That is until recently however, because I am officially addicted to this vegan cinnamon pear pudding with cardamom caramel on top. And I don't mean pudding as in, that creamy pudding-in-a-cup thing. This is more of a bread pudding, pudding. But without the bread of course. 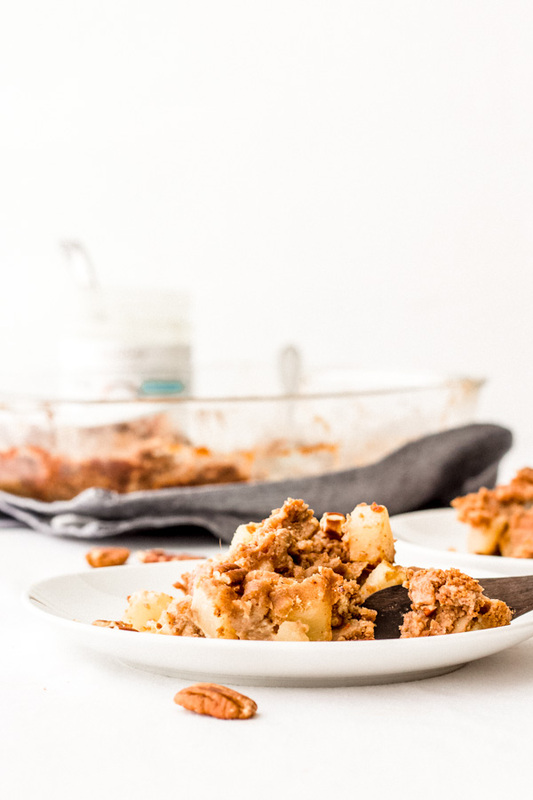 It's like a baked apple crisp, but with pears instead. The inspiration for this recipe came about because I had a bag of pairs that I bought at Trader Joe's, (and had promised future husband that I *would* eat them this time) so I had to come up with a tasty way to enjoy all these pears - so pear pudding it was. 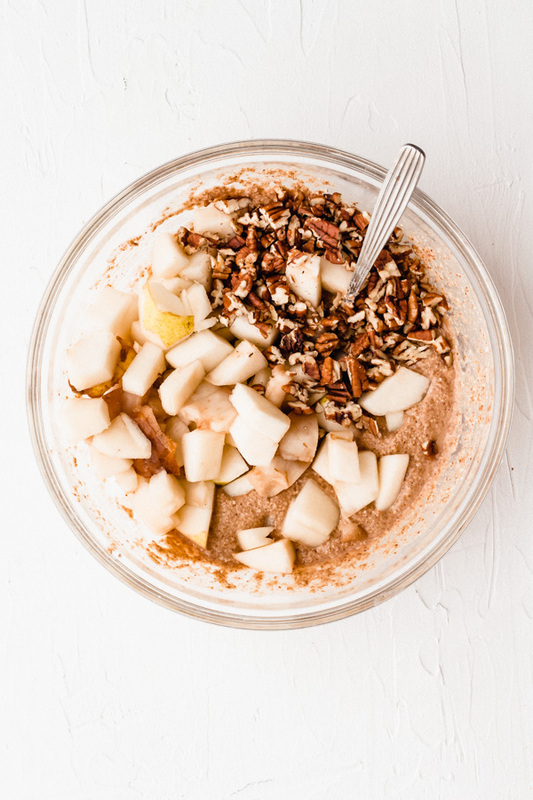 This recipe was to go out during this past fall but life happened and it kept getting pushed back and here we are almost mid-February and I'm posting cinnamon and cardamom recipes because I don't think these flavors EVER go out of style. 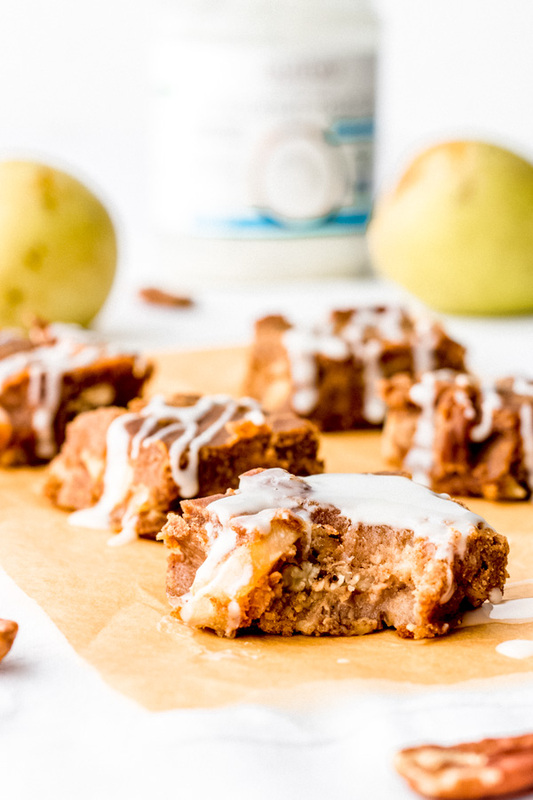 Plus, d' anjou pears are in season right now and I think these are the perfect type of pears for this vegan pear pudding. 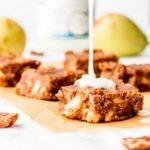 I have tried this dessert with Bartlett pears, and even though I truly do love eating those fresh, they were not AS soft as d' anjou pears after baking. Based on my internet research, d' anjou pears are thought of as the best pear for baked goods - and my experimentation proved that to be true. The baked pears were soft and sweet (very similar to baked apples). On day one, freshly baked, the pear pudding is soft, crumbly and more 'crisp-like' consistency (and honestly, my favorite way to eat this). 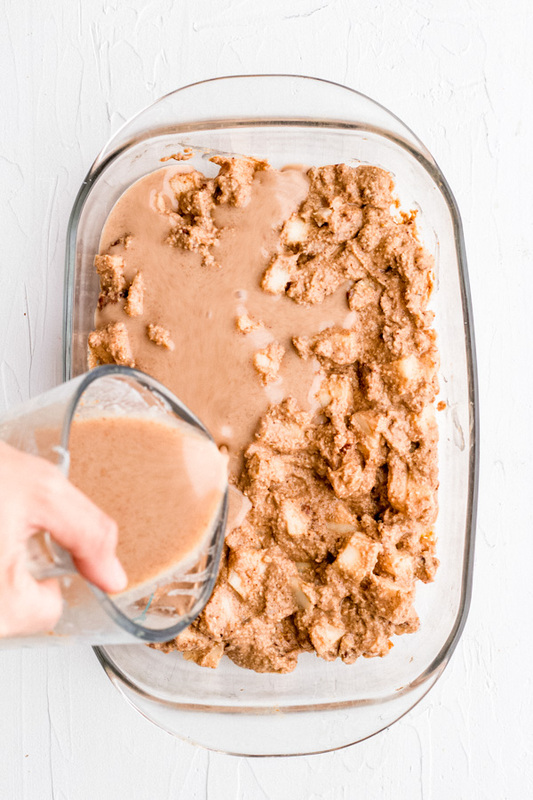 On the second day after being in the fridge for a few hours - the pudding becomes more solid and is better served in squares or bar shape pieces. The taste is not affected but the consistency is so keep that in mind. I show pictures of both consistencies so that you have an idea of what i mean... on the 2nd day I like to cut up the pudding into squares (or bars) and serve them that way instead. 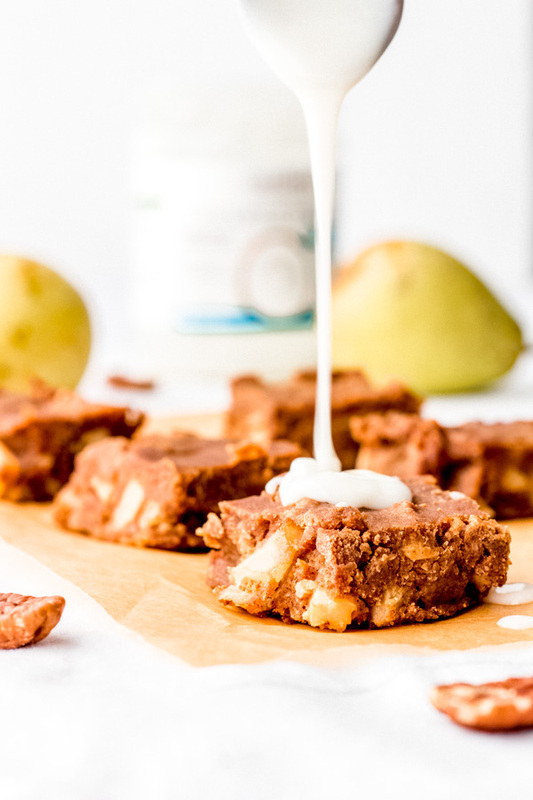 They also make for a great healthy-ish meal prepping sweet treat! Want to see more baked sweets? Add dry ingredients (oat flour, baking powder, date sugar, salt, cinnamon and cardamom powder to a mixing bowl and combine. Peel and core the pears and chop into squares. Add to the dry ingredients along with the roughly chopped pecans. Add almond milk to dry ingredients bowl and combine until everything is mixed. Spread mixture onto a baking dish (10×7) and bake in the oven at 375F for 40 minutes. Make the sauce. Combine hot water, date sugar, vanilla flavoring, spices, coconut butter, agave and pinch of salt until smooth and creamy (use hot water to help dissolve the date sugar). After 20 minutes of baking the pudding, add this creamy sauce on top and bake for another 20 minutes. Remove from oven and let pudding cool down before serving as it will continue to harden as it cools. 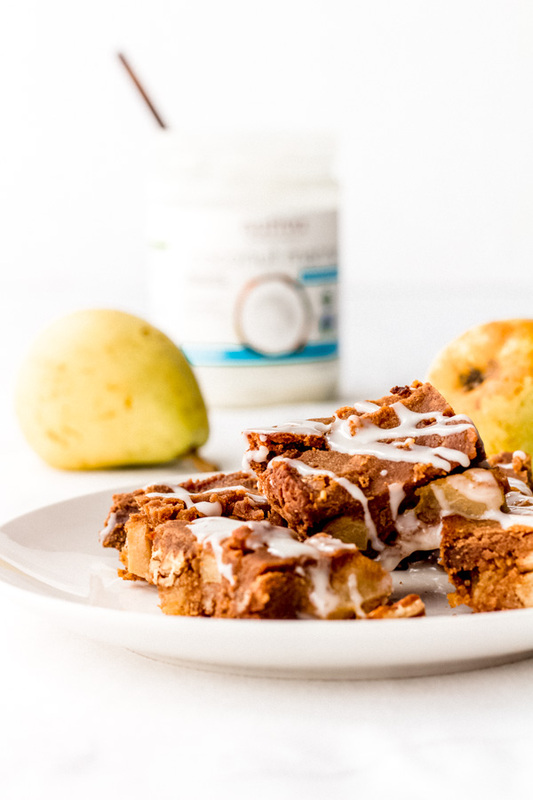 Enjoy with a serving of ice cream or with some coconut butter drizzled on top. date sugar is just dehydrated dates that have been blended down into a powdery form resembling sugar. I buy mine at whole foods, but you can buy it online here. I haven’t tried this recipe with a liquid sweetener such as agave (it might work as well but I can’t guarantee results). You can also use any other natural sugar such as brown cane sugar. I make my own oat flour by processing one cup of rolled oats in the food processor until I have a really fine flour. On day one the pudding will be soft and crumbly but after sitting in the fridge for a few hours or overnight, it will harden and is better served as squares/bars.